The Modern Collection by Universal Furniture is sophisticated, clean, simple, bold and a bit daring. It honors its roots in Modernism but doesn’t replicate mid-century style. The focus is on livability and usability, making it comfortable enough for every day. 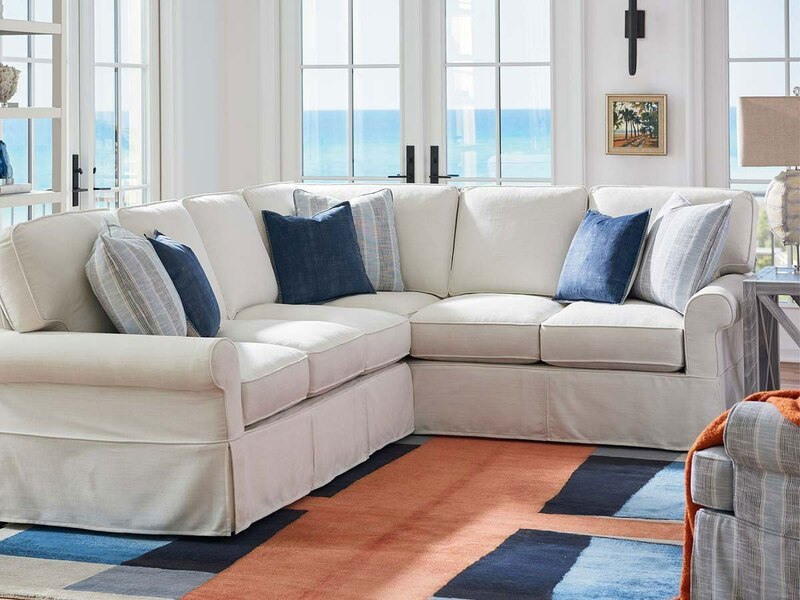 While Mid-century Modern evokes a definitive style, Modern by Universal was developed to serve as a flexible furnishing base with room for interpretation by retailer, designer and consumer. The collection represents a wide range of aesthetics and depending on merchandising options, it can be conservative or glamorous, relaxing or invigorating, neutral or colorful. The collection offers bedroom, dining and living rooms category. Styles include sled-base dining chairs, track arm sofas, a sinuous chaise and several leather-accented chairs. Modern by Universal is primarily a finish and hardware story. Textural sandblasted and wire-brushed finishes were developed and refined using complex layering techniques, and variations of color and sheen to achieve a dry, casual optic. There are several distinct colors in the finishes, though all are neutrals, which work together naturally, even within the same room. Each one is rich in character and texture, letting the material speak for itself. Wood finishes are complemented by metal and leather accent finishes. Sandblasted – Sandblasted finishes expose the open grain of the wood, more so than the wire brushed finishes in the collection. Wire brushed – In an effect similar to sandblasted, but with more subtlety, the wood is abraded by hand to achieve an aged look. Antiqued bronze drawer pulls, cabinet handles and dining able accents feature ribbed detail are paired with sandblasted and wire-brushed woods. Sleek brushed brash hardware gives a mid-century metropolitan feel to mahogany finished furnishings. FurnitureCart is an authorized dealer of Universal Furniture International, Inc. that offers good, affordable, smart design. A highly regarded source for beautiful home furnishings at attractive prices. Universal Furniture creates quality furnishings for the whole home with a focus on function and lifestyle. The company’s casegood, upholstery, accent and accessory designs are developed under the brand names Universal Furniture (Lifestyle Collections), To The Trade (Interior Design) and Smartstuff (Baby and Child). The unpretentious, yet casually elegant, lime washed homes of the French / Belgian border towns are recalled in Elan Collection by Universal Furniture. A collection of furnishings that captures design elements of two beautiful countries. The simplicity of Belgian interiors and the detail of French designs meet in a look that is simple, seamless and sophisticated. The palette of cool, contemporary neutral tones is restful and feminine, almost ethereal. Pieces are intentionally antiqued to give depth and texture. And what may edge on rustic to some is actually luxurious restraint. Elan downplays contrast and extraneous detail in favor of interiors that create a quiet atmosphere full of light, no matter the weather.